The Brenig garage doors are in a way the baby brother (or sister!) or our Conway garage doors. With four windows per garage door (eight per pair!) rather than the six that the Conway features, the Brenig is available in a selection of five kiln dried timbers including Unsorted Scandinavian Redwood (Softwood) for those on a budget. The openings for glazing add a touch of individuality to these wonderful wooden doors, allowing the benefit of natural daylight into your garage space with the knowledge that your prized possessions are safely enclosed by the sturdy doors! The Brenig doors from the rear, additional hidden rail & diagonal braces – they don’t just look good from the front! The rear of the Brenig doors is much the same as you’d expect from our made to measure garage doors, with mid-height hidden rail and diagonal braces that spread the weight of the doors down to the bottom hinges! Got a grumpy old garage? Then why not make it smile with a pair of Brenig garage doors? Why not get in touch for a full personalised quote and get a pair of our striking Brenig doors to cheer up your garage? Pre-beaded internally – As with all of our garage doors with windows, the Brenig can take double glazing. Looking for more garage doors with windows? 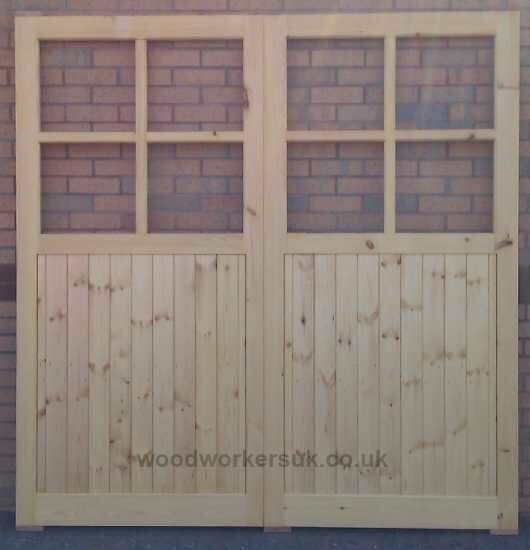 Then why not try our Georgian style Conway hardwood garage doors? If you’re looking for something a bit more simple then give our Elwy garage doors or Aber garage doors a look! 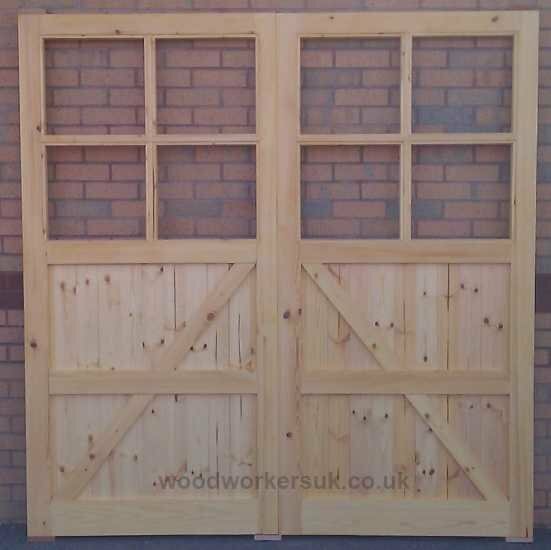 The Brenig guide prices are based on a pair of doors 6ft 6 high x 6ft 6 overall wide (approx 1980mm high x 1980mm), these are NOT from prices, smaller doors will be more economical etc – contact us for a price! All prices are correct time of insertion and are EX VAT. Free delivery to most parts of the UK mainland is included – exclusions do apply, again please contact us. To get a personalised costing on our Brenig made to measure garage doors please use the form below.